Pictures from Youth games are added at the bottom of the page. A link to results for previous seasons can be found in the right hand margin of this page. The team coach is Neville Hughes, and Assistant Coach is Gethin Thomas. 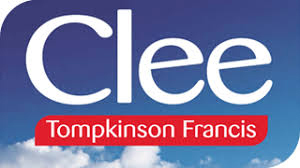 Team Manager is Eifion Jones. 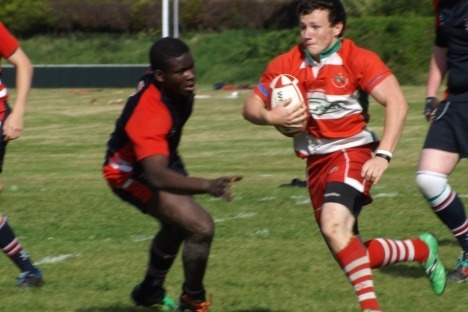 Youth Captain is Dafydd Jenkins. Youth Vice Captain is Nico Bugelli. The season has come around again and we have a friendly against Pontypridd who have come with a substantial squad of players to Church Bank on a sunny afternoon between all this summer’s wet weather. The changing room looked a lot different from last year, with Neville amazed to have 20 players to pick from last year’s Under 16 team which has provided us with a few more players, but it seems that some of the boys for this fixture will have to play out of position with a large number of forwards in the squad having to run a bit more as backs for today’s game. The game started off on a bad note for the young Drovers with Ponty scoring two early tries and the boys not gelling well as an unit but it’s early days and, as the game wore on, the boys got together and with pressure building penalties were taken, with Dafydd Jenkins kicking 2 out of 4 making the score 10-6 to the visitors. Aother try for Ponty saw the score go to 15-6 but a bit of individual skill from Kieran Elliot saw him break through the centres and bamboozle their full back to score under the posts, with Dafydd converting taking the score at half time to 15-13 to Ponty. Neville’s famous halftime team talk was then made and the second half started with a bang with both teams wanting to show the crowd some open rugby. It must be said that the referee had a good game throughout, ensuring a fast flowing game. Ponty scored again, taking the score to 22-13, but the forwards were now working more as an unit and some barnstorming runs from Alun Thomas saw them camped on the Ponty line. After several penalties the ball was passed to Alun who barged through to take the score to 22-18. With the sun and tiredness taking its toll the players on both teams were making some mistakes and it was from one that Kieran intercepted from the halfway to score under the posts and Dafydd converted to take the score to 25-22 to the Drovers. It seemed a first win was on the cards but as time was running out the weather etc seemed to take its toll more on the Drovers and they leaked another 3 tries with one conversion and the game was lost by 41-25. But it was the first game of the season and the omens look good. A few more backs would make the squad complete but as ever they will continue to improve. With games coming thick and fast this was the first local derby of the year, with Brecon bringing a mix of experienced and youngsters to the field nearly as much as the Drovers. The privilege of playing on the Firsts’ pitch was what was ahead for the boys. The game started with all the boys who didn’t play on Saturday starting the game and a few experienced older boys on the bench. Brecon started off the quickest with a penalty and a early converted try to take the score to 10-0 but a penalty from James Morgan made the score 10-3. The youngsters in the team started to listen and face up to their bigger opponents. The game woke up with them taking the game to Brecon but they scored another penalty to take the score to 13-3, but back we came and a move upfield saw James getting the ball in their 22 and he evaded several tackles to score wide out and convert to make the score 13-10. But with the half coming to an end and the referee allowing crossing in the centre of the field the visitors scored wide out to make the score 18-13 at halftime. Neville’s team talk and a few changes at halftime saw the boys come out after the break with another gear and they took the game to Brecon, who didn’t score in the second half. But with the Drovers missing a few penalties it was saved for the last five minutes for the experienced player Tom Bailey to ghost through and score under the posts and Dafydd converting to take the score with minutes remaining to 20-18 to the Drovers. With a nail biting few minutes and the boys trying to run out of the 22 Neville was pulling his hair out but the ref’s whistle came with relief all around and a great boosting win for the young Drovers. It will be up another gear for Saturday’s local derby with the much fancied Llandeilo Youth. The game started with Llandeilo having the upper hand due to their older boys being to the fore but the younger Llandovery 15 faced up well and should have score first, with the ball spilled close to the line in the first five minutes and then a missed penalty. Llandeilo soon rallied from this onset and they went upfield and scored a penalty to take the score to 3-0. 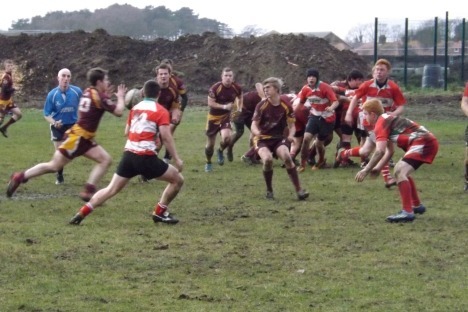 This gave them confidence and only strong tackling from the Drovers kept them at bay! Another Llandeilo penalty was converted to take the score to 6-0 but the Drovers came back, with Dafydd Hughes scoring under the posts for an easy conversion from Dafydd Jenkins to make the score 7-6 to the Drovers. The score remained the same until about five minutes from half time where the visitors spread the ball wide and scored in the corner to take the score to 11-7. With a few missed penalties and wayward kicking keeping the pressure on the young Drovers one of the penalties was converted to take the score to 11-10 at half time. Then came Neville’s half time pep talk and the second half started with both teams making a game of it and with the final ball going astray and penalties missed the score remained unchanged until half way through the half where Llandeilo took a quick penalty and scored wide out, with the Drovers flailing at the tackles. A good conversion from the try line took the score to 18-10. Then came a disturbing tackle to Kieran who went down with a neck injury and the game had to be abandoned with 15 minutes left, and an ambulance called for. The winner was rugby, with both teams agreeing that the injured player should come first, and we thank both teams and officials for being so concerned. Next up is a friendly against Tumble on Saturday at home. With a few players out through injury it was with a bit of trepidation that we played Tumble but they were in the same situation with a few key players out. The game started as usual, with the Drovers on the back foot and their opponents taking advantage, but both teams wanted to play rugby and there were a lot of mistakes. Tumble took the lead with a penalty to make the score 3-0. That was to be the end of their scoring and the Drovers were rewarded when a penalty close to Tumble’s line was taken forward and eventually over their line with Sion Morgan scoring a try, converted by Dafydd Jenkins, to take the halftime score to 7-3 to the Drovers. Then came Neville’s team talk and the young Drovers came out in the second half into the teeth of the wind which they had not used well in the first half. It was another half of errors, with both teams wanting to play rugby. With spilt ball and forward passes as well as some wayward kicking the game seemed to be petering out to a 7-3 win. 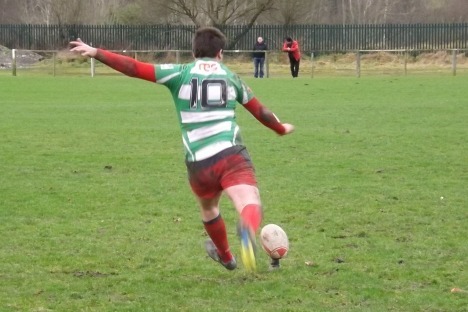 Then came the highlight of the second half, the interception by Tom Bailey who ran 40 metres to score under the posts. Dafydd’s conversion took the final score to 14-3 to the Drovers. 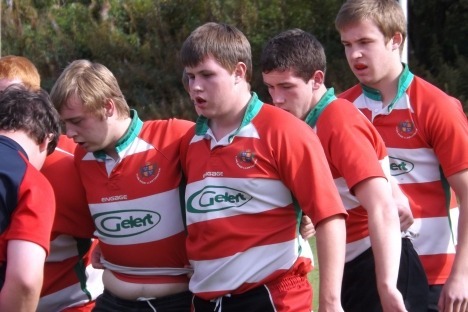 Next Saturday sees the Youth away to Carmarthen Quins for their first league match. The day started brightly with the sun out and a warm day for the game, but come 12.30 a chill went around. When the bus was to leave a big cloud was over the clubhouse – only 13 players turned up with a promise of another one turning up in Carmarthen. And it was to get worse – when the 14 players got together with 12 forwards and only 2 backs it seemed we were going backwards, after a good turnout for the 4 previous friendly games. Neville was in a state! Our first league match, against the old enemy, and a team of forwards! But what must be said at this point is that the boys who turned up did the Drovers proud when the game eventually started. It was an uphill struggle from the first kickoff and we were lucky to be only 20-0 down at half time but the Quins soon cottoned on that we had mostly forwards and, with 10 minutes of the game left, the score went over the 50 points and the referee blew the final whistle. However, it must be said again that there is no blame on the boys who turned up but the blame was on the boys who didn’t turn up. This will be a set-back and a severe learning curve for the boys on the pitch but they tried their hardest and stood up to the opposition. Therefore in conclusion it must be said that we need all players to turn up to training and to the next away game against Waunarlwydd to boost Neville’s flagging belief in the future of Llandovery Youth. So boys I urge you to all to turn up and ensure that this was the one and only bad day for this year’s Youth!!!!! The afternoon was a bright one to welcome our Irish friends, Villiers of Munster, from the Emerald Isle but all was not well in the changing rooms, with only 14 players ready to take the pitch with another on the way, and this is how the game started. The Villiers team came out with guns blazing and we were lucky to keep them out. The Drovers we went upfield where Kieran scored wide out, and with no conversion his took the score to 5-0 against the run of play. This made the visitors more determined and they did have a genuine try disallowed. This set-back was capped when Kieran scored his second to take the score to 10-0. Villiers responded with a penalty to take the score to 10-3. 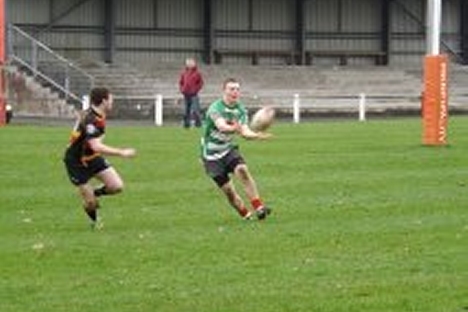 This comeback was short lived with Dafydd Hughes scoring to take the score at half time to 15-3 to the Drovers. The second half was dour, with both teams failing with a late pass, and the only score was another try for Kieran for his hat trick to take the final score to 20-3 to the Drovers. The two teams were fed and watered by the club and we hope to be able to go out to Ireland for the return game. Boys we still need more effort to turn up for training and to games on a Saturday!!!!!! The day started off on a bad note when a 15 seater bus turned up with 18 players ready to board it!!! Therefore some of the boys and Neville took their cars down and picked up another few boys on the way and we had over 20 players ready for a game. The first half of the game started off badly with Llangennech pressing the line and the boys having to put in tackles and more tackling. In the end the pressure told and the home side scored a try and conversion to take the lead 7-0. This lead was extended with another try and conversion and it was made worse with another try just before half time to take the half time score to 17-0 to Llangennech. But with the usual half time team talk from Neville the Drover boys came out with a better attitude and were soon on the board with a try from Elgan and a conversion from Dafydd to take the score to 17-7. This inspired the boys and they soon scored again with a try from Harry Millidge to make the score 17-12 with about 10 minutes to go. This was a boost for the boys and, with another great effort with tackling and attacking, we scored wide out with Rhys Morgan scoring and Dafydd converting to take the score to 19-17. With the last play the boys kicked the ball out and Neville was shouting that they should run with the boys telling him they’d won! So a great day in this year’s Youth season. It was fantastic to see the smiles on the boys’ faces and it shows what can be done with the right amount of players. So as the motto states: NI YMA O HYD!!!!!!! Upwards and onwards for the rest of the season!!!! With a few boys crying off due to a wedding, and no training on Thursday because of a 6th form party, it didn’t look good for this game. When the bus turned up, and another two boys brought feeble excuses that they could not play, with only 10 players sitting on the bus it was another disaster ready to happen. But Gethin turned up with a few players from the college and the team travelled, albeit with a bare 15 players. It would be easier to say that the 15 came back, gave as much as they could, but lost 33-13. In a nutshell, the boys need to buck up and turn up if the Youth team is to survive. There was a bit of hope in the dressing room before the game, with 19 boys changing. The game started well, with the Drovers taking the game to the College and being camped on their line for long periods without a score. So it was disheartening to see the College run the ball so effectively and scoring the first try, which went unconverted to make the score 0-5. But the Club boys persevered and came back strongly, with Alan scoring and Dafydd adding the points to take the halftime score to 7-5 to the Drovers. As is known this is when Neville starts his famous half time team talk and it must have done some good because the boys came out with the same heart and determination as per any second half. With the Drovers forwards now dominating, and tackling being done by 1 to 15, the College score was kept at bay throughout the second half, with the only score being 2 penalties to Dafydd to make the final score 13-5 to the Drovers. The margin could have been wider if the Drovers had not wasted several opportunities on the College try line but also it must be said that, when the College had the ball in hand, it was panic in the Drovers’ ranks. A well played game was won by the better side on the day, with Neville a very happy chappie!!! The day started brightly and it was with enthusiasm that Neville saw a full changing room ready for action with an early kick off before the main match (what a deflator). The visitors came with a large squad and wanted to play a league game but due to several key players missing it was decided that it remain a friendly, and with 11 of their players having first team experience the decision seemed a correct one. The Wanderers started off with a bang and were soon in front with a try. This was soon followed by another, and a conversion, taking the score to 12-0. But the Drovers fronted up and tackled bravely and with support Richie would have scored a spectacular try, which would have been deserved after his break from the forty metre line to just fail to have support in their 22. The visitors had the last say of the first half with another try to lead 17-0 at half time. A league game between the internationals and we all needed a pick me up. With a full team and reserves turning up for the game the prospects were looking up but it was with some trepidation that the Youth took the field, with Ammanford looking the bigger team. From the start it looked as if they were well prepared and it went from bad to worse within the first five minutes with the visitors’ pack dominating and scoring a try and a penalty to make the score 8-0. The afternoon seemed to be a long one ahead but the boys rallied and a penalty was had from Dafydd Jenkins. The boys bucked up with a try late on, also from Dafydd, and a conversion to take the half time score to 10-8 to the Drovers. It could have been even better if Dafydd would have kicked the two penalties on offer. With the usual half time team talk by Neville the boys rallied well. 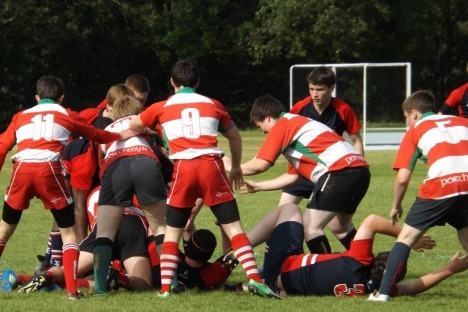 They kept the ball away from the larger opposition forwards and frustrated their opponents who eventually let in Kieran to score another try to take the score to 15-8. With Ammanford getting more and more frustrated they gave away a lot of penalties of which Dafydd converted one to take the final score to 18-8 to the Drovers. This was a game which the Drovers Youth dogged out. With a bus full of players the Youth went away confident after their last win against Ammanford, but with the pitch a bit frosty and the home team yet again bigger than ours it was with a bit of caution that they took the field. 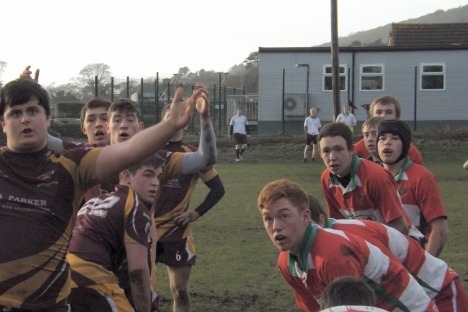 But as we now know the Drover youngsters have faced up to bigger and come out on top and this was to be the case again – with a couple of tries from Dan Charles and Dafydd Jenkins, who also kicked two penalties, the Youth came away with a good win by 16-8. This will help towards next weekend’s away match against Llanelli Wanderers in the league. 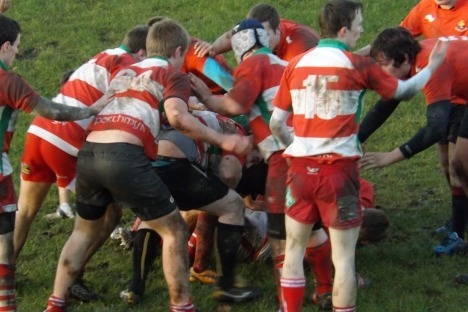 It was with a lot of doubt and a bit of trepidation that the Youth travelled to Llanelli Wanderers after a heavy defeat at home in a friendly recently and with a few of the regulars missing, but go they did. 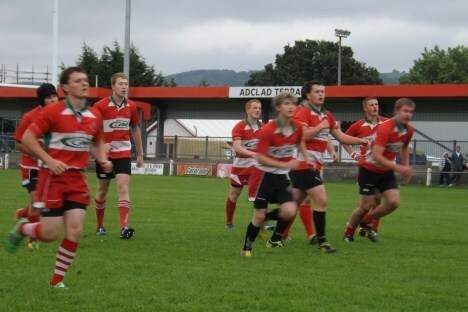 The game started at pace and the boys showed up well again with a lot of tackling and slowing Llanelli’s ball down. With heavy conditions it seemed that the pitch would suit the home side’s heavier forwards but with the half progressing it was the Drovers with the lead by a try to a penalty 5-3 at half time. It seemed inevitable that the more experienced side would pull away in the second half but it was not to be. With the young Drovers sticking to their guns and facing up and tackling their bigger opponents it was Llandovery that scored again, but failed to convert to make it 10-3. But where it looked that a famous victory was on the cards Llanelli pulled a try back in the corner and converted to take the final score to 10-10, and with a happy coach and team travelling back up to Llandovery. It shows that, with a young team coming together, anything is possible, even if the opposition is older, bigger and not always wiser. So come on Drovers, onwards and upwards. Ni Yma o Hyd!!!! With a nice dry day and a good squad of players the home side wanted to avenge the heavy defeat away earlier in the season. The referee had travelled down from North Wales.The game started off at a great pace and, with the larger Carmarthen forwards taking the ball up the field and the Drovers tackling bravely, it seemed inevitable that they would score – and they did, scoring two early tries and conversions making the score 14-0. But back came the Drovers with gusto and scored a well taken try from Dafydd Hughes: 14-5, and this is how the score remained until half time. The second half started brightly for the Drovers and the game hinged on a controversial decision by the referee who failed to allow what seemed to many to be a legitimate try to the Drovers which would have brought the game to 14-12. This disappointed the young Drovers and, with them still talking about it, Carmarthen swept upfield and scored their third try and conversion to take the score to 21-5. But the never-give-up attitude of the Drovers came into being and they scored a try through Rhys Morgan, converted by Dafydd, to take the score to 21-12. With a bit more maturity the game could and should have been won but Carmarthen scored an opportunist drop goal to make the score flattering to them by 24-12. This was yet one of those games that will be remembered and hopefully mature the Drovers for the future. With the weather having got milder, the pitch slightly heavy, a good squad of players and a drying wind the game went ahead late due to the Llangennech bus being delayed. It started with the Drovers making good inroads into the teeth of the wind. The smaller forwards were showing up well against the bigger visitors but some wrong options were taken and we were pegged back when we should have had the first points of the game. Llangennech capitalised and went upfield to secure a penalty which was kicked to give a 0-3 score. With the half nearing its conclusion Llangennech again kicked a penalty to take the score to 0-6, and we had the last say of the half with a difficult penalty which went just wide. It seemed that the Drovers should be able to cut the deficit with the wind behind but the second half went downhill, with a lot of missed tackles and wrong options where there were scoring opportunities. The game went further away from the boys when a mistake in our own 22 lead to Llangennech running a penalty, scoring and converting to take the score to 0-13 and this is how it finished. With heads bowed and a quiet changing room the afternoon finished rather glum all around. But hopefully this was a one off and not to be repeated in future games – the boys will learn and bounce back!!!! With the weather dry, overcast and with a heavy pitch the Youth turned up, a bit short of players due to some injuries and other things. Sixteen players took to the pitch, again against a bigger team and, with a few unexpected decisions by the referee, they were soon down 3 – 14, the home score being a sole penalty by Dafydd Jenkins. With the half pulling to an end Richie got the ball and streaked up the field to score a terrific solo try, the best seen this year at Llandovery according to the watching chairman Handel Davies, taking the score with the conversion to 10 -14. But there was more to come before half time, with another solo try by Richie to take the score to 15-14. Pontyberem then scored a penalty to give them a 2-point lead, at 15-17. With the half nearly complete and the Drover boys on a high the Pontyberem centres tried to spread the ball wide at which the alert Dafydd Jenkins picked the ball out of the air and ran upfield to score under the posts. With the adrenalin flowing he tried to drop kick the conversion, which he missed, and the referee blew up for half time with the score 20-17 to the Drovers. Neville’s team talk was not so demanding as usual but they came out after half time with a wind behind and a mood for more scores. But it got harder, with both teams tackling – some good, some bad ones – and with the Drovers taking the game to the opposition they soon scored again, with Harry taking the score to 25-17. Pontyberem seemed to be rattled and were questioning the referee’s decisions and eventually he handed out two yellow cards, which the Drovers could not make the visitors pay for with the corner kicks going too far behind the try line. But eventually Llandovery kicked a penalty which was to be the last score of the game, to take it to 28-17 to the Drovers. A further penalty attempt hit the post and with that, and a number of dropped balls, that’s how the scoreline stayed, but a lot of the players grew up today and showed what can be done with effort. But it was Neville’s last words that they took back into the dressing room – that it showed what can be done when the boys play as they trained and that there is a need for all players to turn up on a Thursday for training!!! With the weather sunny and cold it looked like there would be an open running game between the teams. The visitors seemed to have a heavier, bigger pack than the Drovers and this was going to be a tough match. With the game barely a minute old the ball was passed along the back line and Richie came in on the burst to score wide out to make it 5-0 to the Drovers. Emlyn were rattled but back they came and were soon down in the home 22 and with a penalty they went for the jugular with a scrum option. But the young Drovers held tight and gained a penalty for a collapsed scrum. The youth took the game to the bigger pack and more than once were on the front foot. Eventually another penalty was awarded and this they kicked to give a score of 5-3. It was nip and tuck for the rest of the half and Emlyn were lucky to score a try and conversion on the half time whistle to take the score to 5-10. This was a game to win. With the wind at their backs the Drovers came out with a half time team talk from Neville still ringing in their ears and took the game to the opposition, and it was nip and tuck for most of the half. But the visitors had an injury to their prop and then it became uncontested scrums which saved their forwards from tiring. Some refereeing decisions were going against the Drovers and a yellow card was shown but, down to 14 players, the Drovers came out and scored a try wide out from James and converted by Dafydd Jenkins which took the score to 12-10. Emlyn came back strongly but the Drovers kept them at bay until 9 minutes from the end when Dafydd Jenkins was injured and, with their guard down, the Drovers leaked three tries to flatter the scoreline for the opposition, taking the final score to 12-25 to the visitors. It was with a heavy heart that the Drovers went back to the changing rooms contemplating a game that they should have won. Let this be a harsh learning curve not to be repeated. With the weather at its worst, heavy rain blowing across the pitch and a full complement of players, the game started with a bang and Brynamman soon showed their intent by running back the kick off and gaining ground down the blind side. But this spurred on the Drovers who were soon up in their 22 where we spurned two kickable penalties. The Drovers forwards were awesome – with so many takes against the head we lost count and good driving mauls by the back row of Harry, Alun and Dan. It seemed we were taking the wrong option within 10 metres of their line but we did eventually get a score through a bullocking run and drive from Harry. Dafydd converted the try to take the score to 7-0 to the Drovers. The fact was that the Drovers were so dominant that Brynamman failed to get into the home 22 more than twice in the first half, but despite this the score remained unchanged up to half time, when the rain relented. Neville’s team talk at half time ensured that there was no complacency and that it was still there to lose, but the forwards dominated proceedings. With two tries to Alun Thomas, who sprayed their defenders away easily, and with Dafydd converting, and with Bryamman securing a penalty, this made the score 21-3 to the Drovers. But as sometimes happens, with the game nearly won the Drovers tried to pass the ball in mid field via long passes and Brynamman intercepted and scored under the posts to take the score to 21-10. So, game on! But with a near miss of another interception – which would have made the final five minutes interesting – the Drovers bucked up and replacement James scored wide out to take the final score to 26-10 to the Drovers. An excellent win with the foundations laid by the forwards and backed up by sound tackling by all 16 players used it was nice to see a full squad. So, Boys, let’s keep it going and make it a good run in for the rest of the season!!!! With boys pulling out on Friday night and on Saturday morning only ten players went on the bus. It didn’t look good going away to one of the best sides in the league but we did gain another three players by the time the game started. And when Ammanford didn’t reduce their numbers to thirteen it looked as if it was going to be a long afternoon. Starting with the strong wind at their backs and a bigger pack of forwards Ammanford soon rumbled downfield and scored a try and conversion to give a score of 7-0. But the Drover boys stuck to their guns and were soon up in Ammanford’s 22 but they gave a penalty away and were soon back down in their own half. However the resilience of the boys showed through, tackling anything that moved, and finally another probe upfield saw an illegal shoulder charge and the home side were reduced to 14 men for ten minutes. The boys rallied and were rewarded when Dan Jones went over wide out. It seemed that the conversion would be missed but we were all wrong, Richie Elliot kicked a low conversion to take the score to 7-7 and this is how it went up to half time. With Neville’s team talk and the boys on a high and with a strong wind behind it seemed we had to make sure that we kept Ammanford downfield but they were wise and just after kick off they swept upfield to score in the corner to take the lead at 12-7. But back the Drover boys came and they battled hard, held onto the ball well, and tackled like demons. Suddenly it seemed all hope had gone when Dan Jones went off, reducing the Drovers to 12 men against 15. This was now Everest but Ammanford were being rattled by solid tackling and harassment and they were struggling to do anything against 12 men. With the odds stacked heavily against the young Drovers they went and scored a try and conversion by Richie Elliot to take the lead 14-12 and this is how it stayed to the end of the match, with Ammanford being thwarted at all phases. All the Drovers proved that Everest can be conquered with grit and determination. The final whistle went and there was a bigger cheer from the Llandovery spectators than when Wales beat England, Neville’s smile was wider than the Bristol Channel, the boys were delirious and Ammanford’s coaching staff were honourable in defeat, stating that they should never have lost against 12 men!!!!! This must be the best team performance ever and the young Drovers went back to the changing rooms with a canter. This shows just what can be achieved against all odds!!! 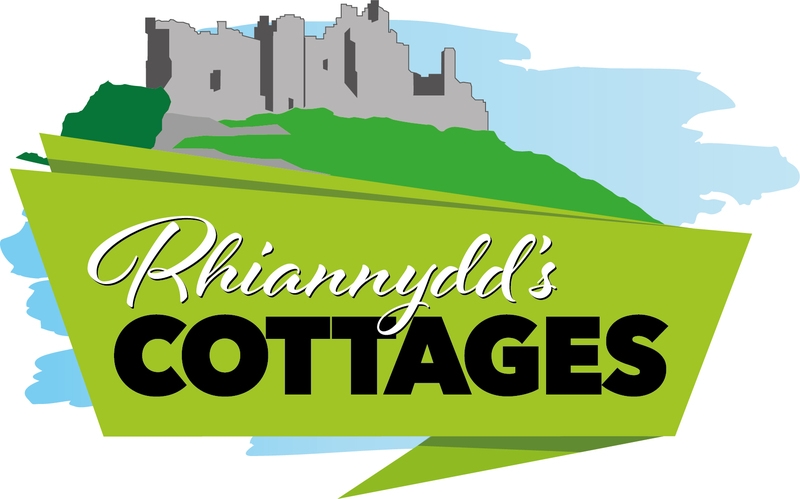 Er gwaetha pawb a phopeth Ni yma o Hyd!!!!!! With the nights getting lighter, a cold wind blowing down the field, the hour gone forward for summer time, it was with great expectation that the young Drovers ran onto the field, but when the Athletic ran on it seemed to be men against boys. And that is how the game panned out with the Athletic knowing when to play, having all their Scarlets and Wales players available, it seemed that the night was to be long one. The Llandovery boys as per usual played and tackled their hearts out and with the strong breeze behind them they were the first to attempt a kick, but Dafydd was unsuccessful with his attempt at goal. Athletic hardly kicked throughout the match and ran from deep and were rewarded on several occasions with tries, and although they did not get the full 7 points they were nevertheless 22-3 ahead at the break. It seemed that the second half would be tougher, especially playing into that stiff breeze, and so it proved to be. With such a large squad Athletic were able to change players which did disrupt their flowing rugby but they thoroughly deserved their win and the final score was 44-3 to the Athletic. 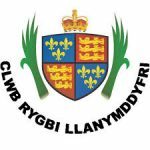 It must be said that all 19 Drovers that were used in the game gave their all and tried their best but it was not to be – but onwards and upwards, another learning curve of Youth rugby. 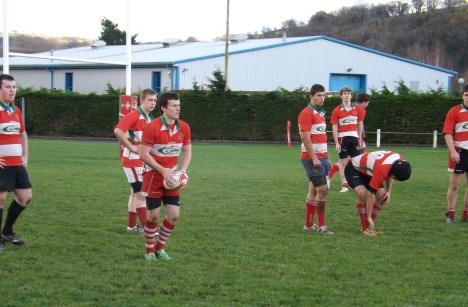 The next youth game is on Saturday 6th April, home against Kidwelly in the league. The day started with the sun shining and a bit of warmth from the early spring sunshine but as the day progressed it got colder in more ways than one.With a few of the Drover boys injured and unavailable it was nice to see 19 players in the changing room and a team was therefore available to start the game with a few subs on the bench. However it seems we needed a whole fleet against a well drilled and older Kidwelly Youth who were up and ready for only their 6th League match of the season and their 5th on the road – and we are in the final month of the season. There is a need for games to be played much sooner than this!!! But that’s another story. Anyway the game started badly with Kidwelly scoring tries at ease and Llandovery were soon down by over 20 points. But as ever the boys stuck to their guns, which was great as the majority of the starting 15 were in their first year of youth rugby!!! And with Nev’s halftime team talk they came out with fire in their bellies and the Drovers’ attitude of never give up, and then scored three excellent converted tries, 2 from Harry and another from Nico, well converted by Dafydd, to take the final score to 57-21 to Kidwelly. Another game that can be put down as a learning experience which will make the boys better prepared for the rest of the season and next year. So boys, onwards and upwards, we are still the Drovers!!!! The afternoon was overcast and seemed to be full of rain. 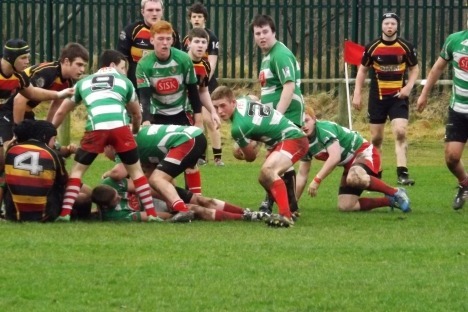 Builth arrived early, with a large squad of players, and yet again their forwards were far bigger than the young Drovers. But as always this year size isn’t everything, as was shown on the pitch with our props Caerwyn and Nico pushing above their weight and making life difficult for the Builth props. With some good running with the ball from Harry and the backline it seemed inevitable that we score but there were no points in the first half, which the Drovers dominated. Despite the game being somewhat broken up by frequent stoppages for offences the young Drovers kept to their guns and, with a few College boys making an appearance which helped the cause, they started the second half yet again on the front foot, with Richie having a few runs. But it seemed that all was in vain, with some wrong decisions being taken, but the boys did score a try through Richie wide out to put them 5-0 up. 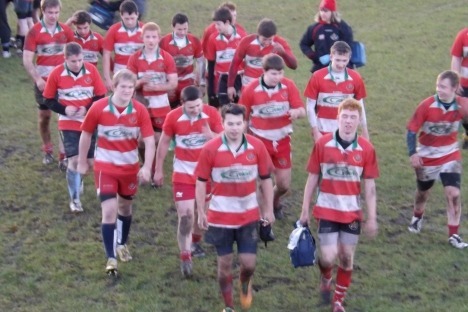 It seemed that Llandovery might soon run away with the match but it still stayed tight. With the forwards dominating, Caerwyn scored wide out from close range and James scored another to make the final score 15-0 to the Drovers. This was a good tough game for the young Drovers to have after some heavy results lately so we go to Newcastle Emlyn next week with our tails up!! and wagging again. With the sun shining and a good squad of players it was with good heart that the young Drovers travelled to Newcastle Emlyn. But on arrival it looked as if Emlyn were up for the game with, as usual, a larger/bigger pack of forwards than our younger Drovers, so it was a need to move the larger forwards around on a warm day.The game started off promisingly and with some good ball retention and tackling the half time score was only 12-7 to Emlyn, with Kieran scoring and Daf converting. But that was the best half of the game and it all went downhill after that, and with the Llandovery youngsters feeling the strain and tiring Emlyn soon scored at will and the final score was 43-7 to them. But with heads up the Drovers travel again next weekend to an away game against Llangennech in the East Carmarthenshire Cup Semi final, with an incentive to win of a Final with local rivals Llandeilo. So all turn up to training on Thursday to ensure a position in the squad!!! It was with good hope and a bit of anxiety that the young Drovers travelled to Llangennech and after some detours we finally arrived at Penygaer fields Llanelli. The boys changed and got ready for the game which seemed to be a training session just walking to the pitch. The game started and from the onset it seemed we would be again second best in the physicality stakes, with a larger opposing team who were well drilled and street wise. 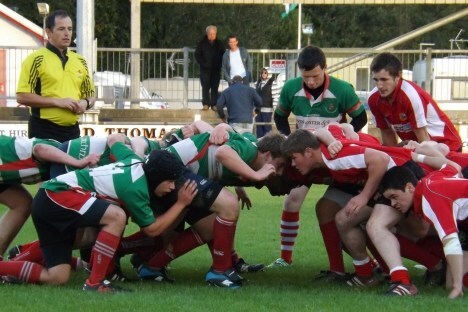 The young Drovers as ever stuck to their guns and harassed and tackled the opposition. With Llangennech scoring tries but without conversions Llandovery were still in the game at half time.